At the heights of our relationship, I loved him more than I can say. At the depths, I lost a sense of ownership over my body and feared for my life. As far as I knew then, love and abuse of any kind – emotional or physical – were supposed to be mutually exclusive. But as our relationship progressed, it increasingly involved elements of both love and violence, and I lived them side-by-side. My belief that the two could not coexist prevented me from acknowledging the abuse, and it stopped me from getting out. Racism hurts white people too. Sometimes this (very true) statement makes me think of my college introduction to microeconomics textbook. It postured that in perfect capitalism, racism in the form of segregation and discrimination would never occur because it would stand in the way of maximum profits. Restaurants, for example, would necessarily miss out on some of the best waitresses by using discriminatory hiring practices, or miss out on perfectly good customers because of segregation. Surely some other restaurant would snap up those waitresses and customers and if one didn’t, the economy would lose out and everyone would be hurt. 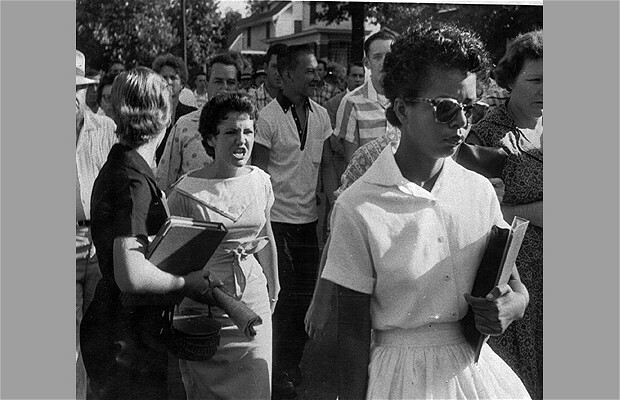 Sometimes, I think of the iconic image below- it is a photograph of Elizabeth Eckford, one of the Little Rock Nine students who desegregated Little Rock High school in Arkansas. She is being followed by an angry white mob which includes Hazel Massery, whose face is twisted in palpable hate. In an effort to “protect” this school from black students, Hazel Massery lost some of her humanity to the acidic hate of white supremacy. She was reduced to her basest instincts. She was hurt. Now a new image, and a more concrete concept, pops up when I think of the deleterious effects racism has on everyone, including white people.